The Gentleman Crafter: Cool Christmas Project and Tutorial - Done! Wow! I've had such a wonderful four day weekend!! I could really get used to these long holidays! Yahooo! 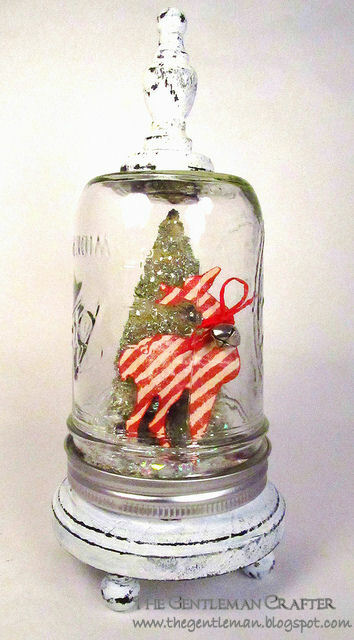 It's been so much fun having extra time to craft!...Last night, I was in the mood to make a Christmas project. So, off I went to dig in my stash. This is sometimes where ideas begin for me...Just digging! I came across a set of Tim Holtz's new Idea-ology pieces...Woodlands. It's the one with the trees and wreath... You just gotta love these pieces! The possibilities are endless! Right next to this sat a Ball canning jar that held some jingle bells....Then it hit me! Snow Globe! LOL! 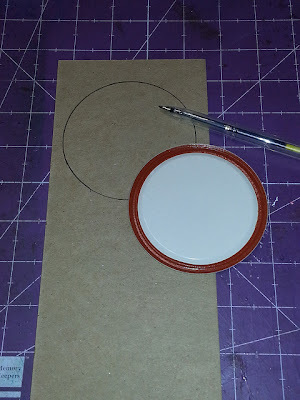 Take the lid of the jar off and trace around it on a scrap of chipboard. Next, cut the circle out with Tim Holtz Scissors. Paint the circle white with the Adirondack Snow Cap Paint Dabber. Allow to dry. 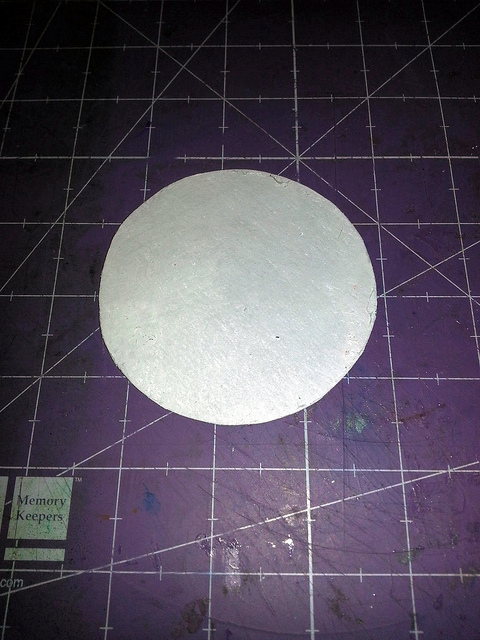 With an Inkssentials Collage Glue Stick, run the glue over the painted surface of the white disk. 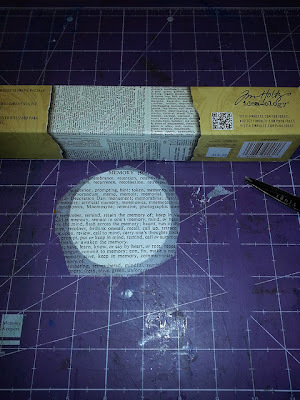 Next, adhere a piece of Tim Holtz Idea-ology Tissue Wrap and trim around the edges of the circle. I'm using a Ball canning jar that I purchased from the craft store, so I adhered the disk to the flat lid and then hot glued the flat disk/lid assembly to the inside of the ring. 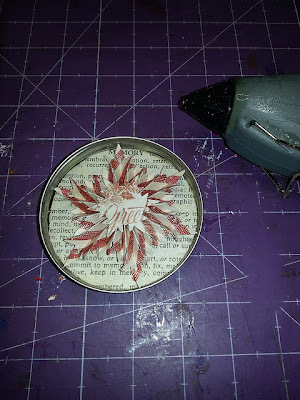 Die cut a Sizzix/Tim Holtz Snowflake Rosette from Tim Holtz Idea-ology Seasonal Paper Stash - Holidays Past and assemble. 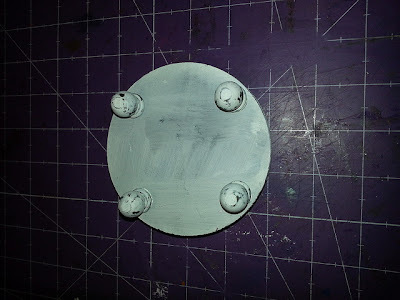 Next, adhere the rosette to the center of the inside lid. 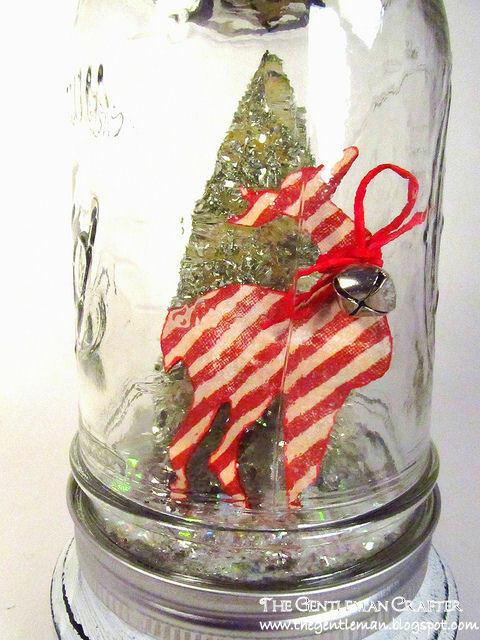 Cover the Tim Holtz Woodland Tree, with glue and then glitter with glass glitter in Silver. Allow to dry... Note: My jar is a pint and did not fit the whole tree, so I used my wire cutters and nipped off the wooden base to the tree. Glue the tree to the top of the Rosette. 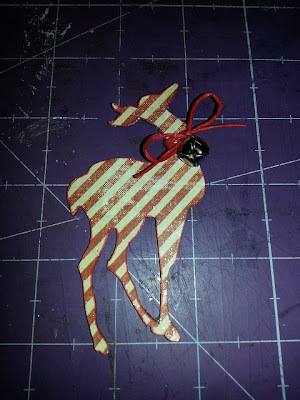 Cover a piece of chipboard on the front and back with the Holidays Past Paper Stash and die cut with the Sizzix/Tim Holtz Reindeer Flight die. 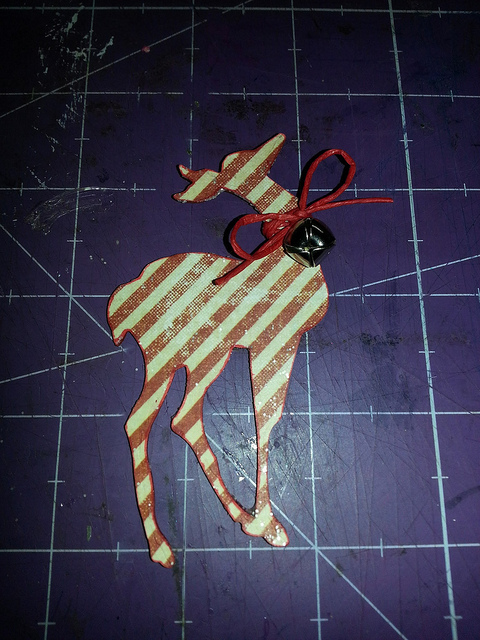 Ink the edges and then tie a jingle bell around the deer's neck. 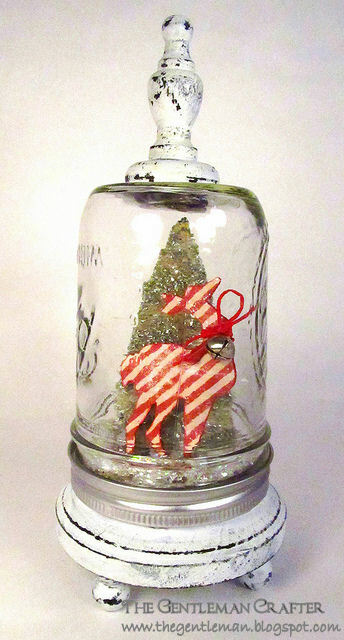 Apply hot glue to the bottom of the deer and adhere to the lid base. 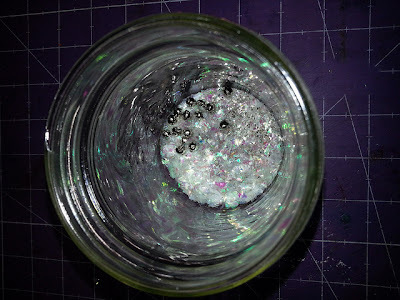 Place a mixture of glitter glass, Mica flakes, and some tiny jingle bells into the jar. Carefully place the lid assembly down on the jar and screw tightly shut. I painted a wooden finial, base and knobs with Adirondack Pitch Black Dabber and allowed to dry. I then went over the raised areas with a wax candle. Next, I painted all the pieces again with the Adirondack Snow Cap Dabber and allowed to dry. Last, I lightly sanded the pieces with sandpaper which pulled up the white paint where the wax resist was used. Glue the feet to the base, the base to the jar lid and the finial to the top...VOILA!!!! 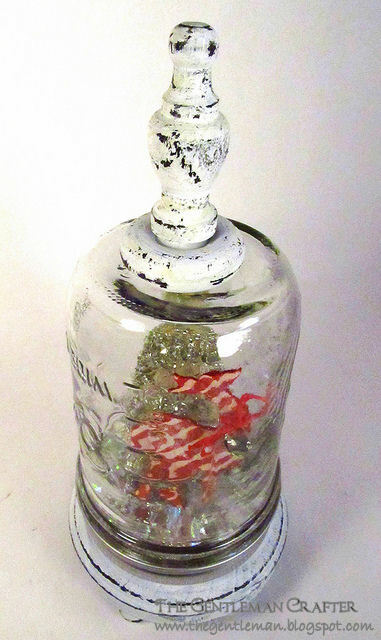 A really cool snow globe perfect for your Christmas decorations or a great gift! What do ya think? Brilliant Jim, Just love it! This is fabulous, Jim! I can't wait to make several of these. So cute, Jim! Thanks for the cool idea! I finally got to see the 2nd part of the "Crafting with Mom & Cesar"...thanks for getting it uploaded for those of us who have been waiting for it. I LOVE how your Mom and Cesar really got into making the tree and your Mom's delighted giggles when it was finished. Love this! I have been wanting to do something with Mason Jars. Only YOU, Jim, only YOU!! This, as are all your creations, is just sublime! Such a genius idea. 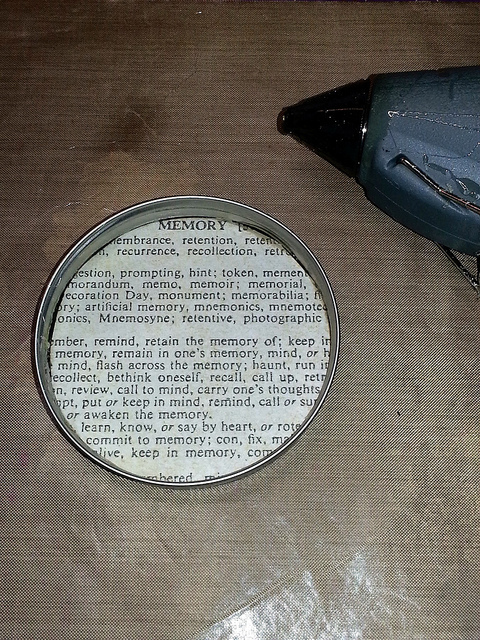 I would never think to glue parts to lid, would have struggled away, trying to see how to get them inside jar. That of course would not work. Not to mention, idea would never have come to me in 1st place. My goodness... you've done it again... so amazing! I love this idea! So cool! What a fun gift. You must have a great stash of those wood pieces as you pull them out as the perfect finishing touch to your creations, ha, ha. Thanks. Love! I have used that Tim deer die several times in the past week. It's my baby! hee hee Seriously, this is a wonderful vintage-look project and I really like it! Such a great idea. I saw one of these on Pinterest. She laminated her images, and then actually put liquid into the jar. Very cool! love your snowglobe. I'm gonna make one for myself. 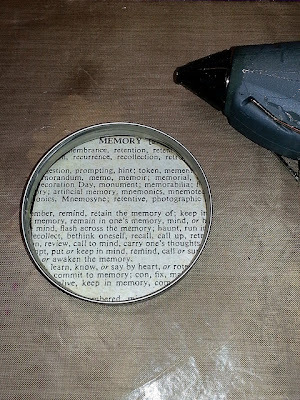 What a great and genius idea for a lovely gift...Perfect for my friends...Thanks for all the cool tips...I love how you figure out all the troublesome details... I certainly will try my version soon! To cute for words!!!! Going to make this with my granddaughter!!! That is adorable! I am going to make a couple with flowers for my kitchen window! Thanks for sharing your great mind with us!